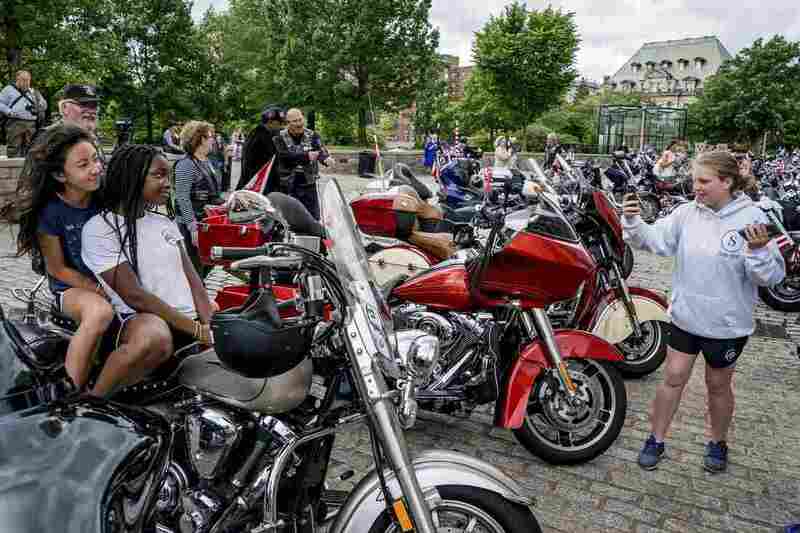 Bikers From Across America Ride To Remember Soldiers 'Unaccounted For' : The Two-Way What started as a group of 2,500 has grown to an estimated 300,000. 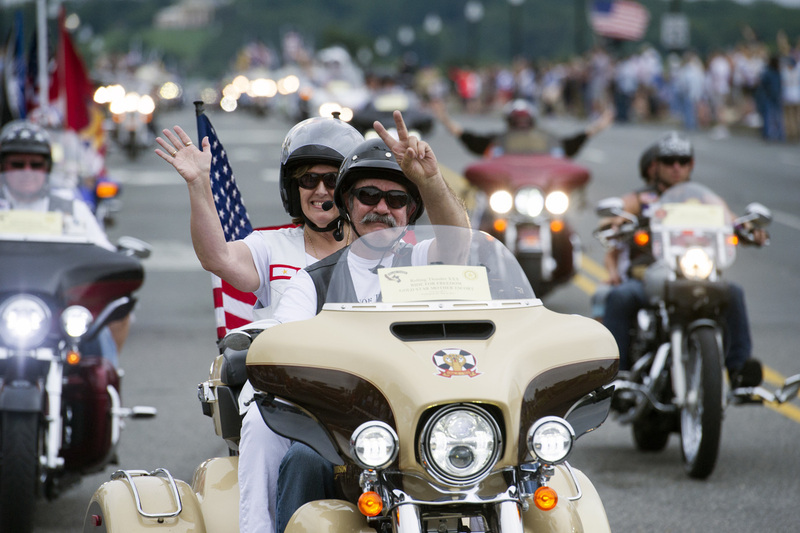 Motorcyclists from across the country rally in Washington, D.C. to raise awareness every Memorial Day weekend. Rolling Thunder seeks to bring full accountability for all U.S. prisoners of war and missing in action (POW/MIA) soldiers. This Memorial Day weekend, American flags wave in quiet reverence at cemeteries across the country. Family members, friends and volunteers plant the flags in front of headstones for service people who died in conflict. The Rolling Thunder rally in Washington, D.C. gathers those who want to remember prisoners of war and those considered missing in action (POW/MIA) in a louder way. The 31st annual First Amendment Demonstration Run rolls Sunday, starting at the Pentagon, circling the National Mall and concluding nearby. Riders and fans hear from speakers at the Lincoln Memorial, and festivities continue through the afternoon hours. The annual Memorial Day Concert at the U.S. Capitol plays into the evening. Riders circle the National Mall and leaves their bikes at a nearby park to participate in events into the night. Organizers consider the event a protest and demonstration rejecting the high numbers of military still listed as POW/MIA. According to the event's website, the ride represents a demand for accountability and recognition of those unaccounted for. Motorcyclists arrive in Washington sometimes more than a week in advance. And the rumble gets louder as Memorial Day weekend draws near. Every year thousands of bikers roar in, through and around the city. And with their high-amplitude display, they hope to amplify an issue that is often silent. Young and old come out for Rolling Thunder events over Memorial Day Weekend, including the Blessing of the Bikes at National Cathedral. 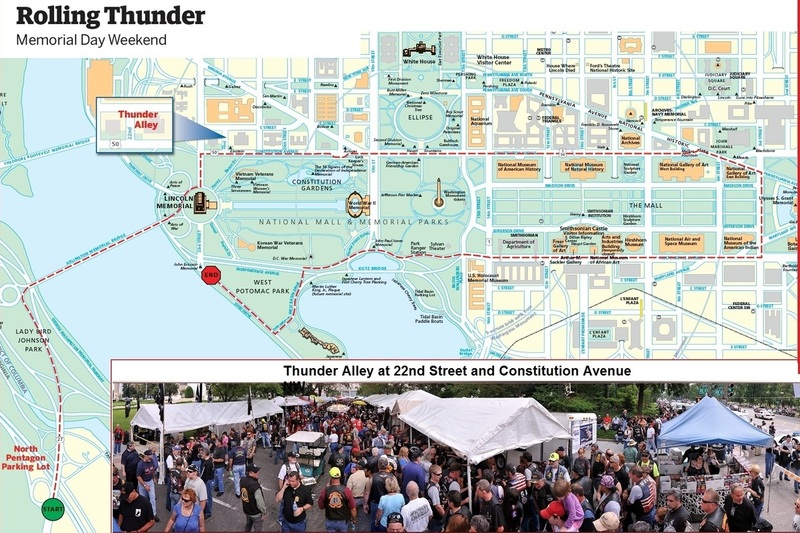 According to Rolling Thunder in Washington, D.C. Inc. - the group that organizes the event - the first rally was in 1988 after U.S. Marine Corps Corporal Ray Manzo returned from the Vietnam War. Manzo was troubled by the accounts of prisoners of war left behind after the Southeast Asian conflict. He rallied support, and came with a motorcycle contingent 2,500-strong, according to the organization's website. Sunday's run was part of a weekend full of activities, starting with the Blessing of the Bikes Friday evening at the National Cathedral and a candle light vigil at the Vietnam War Memorial. Saturday was a relaxed schedule. Vendors set up as part of "Thunder Alley" at Constitution Ave., near the Vietnam War Memorial. Organizers expected riders from most, if not every state. Some public officials made the trip. Rolling Thunder riders and fans will travel to multiple war memorials to lay wreaths on Monday. The formal events conclude at 3 p.m. ET with a national moment of remembrance.